Here they are, cute as could be, on their banding day. Now two of these peregrine chicks are dead and the third was found on the street. What caused this chain of events? Is the fourth chick in any danger? Peregrine falcons have nested on the Brandywine building in Wilmington, Delaware since at least 2002. My friend Kim Steininger, who works across the street, has followed their family life and taken pictures of them for years. Her peregrine photos often appear on this blog. Until last weekend it was a normal nesting season for the Wilmington peregrines. They hatched four healthy chicks who were banded by US Fish and Wildlife Service (FWS) on May 18th. At that time the family was in good health and so well fed that their crops bulged pink through their down. There was no hint of what was to come. After Memorial Day weekend two of the chicks were found dead at the nest. The nest doesn’t have a web camera so no one knows what led up to it. Were the deaths sudden? Were the chicks sick for a while? Were they harmed in a fight among rival adults? Did they eat poisoned prey? Those who monitor the nest were saddened and determined to solve the mystery. They wanted to retrieve the dead chicks and examine them for cause of death but the live chicks were too close to fledging and might jump to their deaths if people opened the access door. The only thing to do was wait. Then on Thursday the third chick was found on the street. His flight feathers were not fully developed and he was clearly not ready to fledge so he must have fallen more than 200 feet to the ground. He was taken to Tri-State Bird Rescue and given a complete medical exam including blood tests for disease and poison. Maybe his condition would give a clue to the deaths of his siblings. His test results were more than hopeful, they were excellent. The blood tests came back negative, the bird is bright and alert and he had no injuries whatsoever – miraculous, considering his tumble to the street. His adventure gave everyone hope and an opportunity to find out what happened to his siblings. Today the team from Tri-State Bird Rescue will return this chick to the nest, collect the dead bodies and gather up prey remnants. Craig Koppie of FWS advised them that the chick who remains at the nest is female and thinks she’s less likely to jump than her brother was. Everyone will be very careful. The dead bodies and prey remnants will be tested for illness and poison. Soon, maybe soon, the mystery will be solved. Update, June 2, 2009: In late May the fourth chick was found gravely injured on the ground, far from the nest. She was so badly injured she had to be euthanized. The chick that was returned to the nest in late May has disappeared and it’s unlikely he’ll ever be found. Sadly, no young have survived. Unbelievable. I hope a human being wasn’t responsible for this. I was wondering if the chick survived because it was so young – the way a human baby will survive a fall because the bones are still soft? I’m glad it survived. How sad. I was reading on a website in I believe Manitoba British Columbia about the peregrines there who have a nest on a Radisson Hotel ledge. Last year after the babies were hatched there was a lot of rain & they didn’t have a box like the ones at the COL or Gulf Tower & the babies drowned in the rain. A fireman rappled down the building to try to save the chicks but it was too late. This year some workmen put what looks like a rubbermaid or tupperware container on the ledge & they put drainage on the ledge so that the water would drain.off the ledge The mother peregrine is laying in this little container over her eggs or maybe chicks at this point & I was watching her on Wednesday & they had high winds there-I guess since she is laying in the container & there is gravel in it the container hasn’t tipped over yet but I worry that once they hatch & the chicks are growing & mom leaves them alone that the container will tip over on them. I can’t bring myself to go back to look just in case something happens to them again this year. This news just in from Kim Steininger in Wilmington! “More bad news. The female chick ended up on the ground before we even got to the area where the nestbox is. We’re starting to think there’s an intruder female who wants the nest. The only way the female chick could have ended up where she landed was if something carried her over to that area and dropped her. These guys aren’t even doing the flapping thing yet so there’s no way they can fly anywhere. We don’t think the female chick is going to make it and now we think we left this young male in the nestbox only to end up being killed. We need to try and see the colors on the females band. If they’re green over black, then it’s an intruder because the other female was banded when they were doing them all with red over black. Why don’t they just go get the male?? rather than take the risk by leaving it there?? I don’t understand why they would do that. Just go get whoever’s left and raise them in captivity and then release them. That’s how the Peregrines were repopulated in this State. It just doesn’t make sense to rescue and then abandon, especially when they just found the other female on the ground. It turns out that they didn’t put him back in the nest yet. The female chick was found on the ground before they put the male one back so they still have him at Tri-State Rescue. He is too young to fly and live on his own. He needs his parents but the nest is too dangerous. Perhaps he will be hacked from another nest. Don’t know yet. It might be good to put a we cam in place to see what is going on? A cam is already in the works for next year. Kim mentioned it at the end of her blog about the banding. Well, that’s a relief. I don’t imagine another set of peregrines would take him, if their own nestlings were the same age? Since they can’t count? Is that what you meant by ‘hacked from another nest’? Maybe the female will pull through. Nature is often violent. I just feel that since we humans already are interfering with nature’s rhythms, in general not just related to the Peregrines, they might as well try to save them. It would mean one, maybe two more, added to the general population. Would it be possible to move the nest box, or create another one close by but in a potentially safer spot, so that the parents can find the remaining chick but the intruder would be fooled? Would probably be too hard…but just a thought. Moving the nest box: When peregrines are fighting over territory, creating a new nest site does not make them stop. A new site would have to be 3 miles away. They stay true to the original location and will fight it out until there’s a victor. Ooops! I got that wrong. This news just in: Tri-State *did* put the male chick back in the nest. I was confused about what order things happened in. I think they hadn’t figured out a rival was present until he was back in the nest. Bummer. Hopefully, if there is a rival, she is beaten away so he survives. I feel conflicted actually. The strongest will prevail which is ultimately the best for the birds as a species – its just that the fledglings didn’t have a chance to even fight for their place. I doubt the male would survive another fall. I’d go get him, if I was them. I still wonder why they would leave it to chance like that? But what’s done is done. I hope he beats the odds. The same thing happened earlier this month to another site in Genoa, mom and chicks all missing and a new female pairing up with the male. Heartbreaking and shocking. Let’s pray that they retrieve the male in time so he can be hacked. could not use her legs. At the time Diane and I put the young male back, we hadn’t started thinking that there might be an intruder female. We were just thinking, here’s a mom who has lost all her babies for one reason or another, and wanted to give her one of her babies back. I have to say that we were a little hesitant because it seemed strange that the two remaining chicks had “jumped”. It wasn’t our call to make though because we had instructions from Fish & Wildlife to return the chick. Now that we’re thinking there might be an intruder female, it’s not as easy as just “going and getting the male”. Trust me, if we could have done that, we would have done that yesterday afternoon! You need approval from Fish & Wildlife before you can do something like that though. I spoke with Craig Koppie again and if we’re able to determine that the female is not the original female, we now have the approval to get the young male. I’m going to the nest site in a couple hours to make sure I still see the young male in the nestbox area and to see if I can get a photograph of the female’s leg to see her leg bands. This has all been very heartbreaking to say the least. It’s hard to believe that less than two weeks ago, there were four beautiful, fuzzy screaming, very much alive chicks and now there’s only one. I just hope that one is still with us. Leslie, thanks so much for your link to the Genoa, Wisconsin story. The situation in Wilmington sounds eerily similar. Until I read the Genoa story I couldn’t imagine a fight between females ending in the death of the chicks. As you said, shocking! Yes, thank you for posting that link Leslie! It sure does seem eerily familiar. I checked on the chick again last night and all still seems to be fine. I’m hoping if it was an intruder that she’s gone now. Even if I had approval from F&W to take the chick, I would have a very hard time taking the momma falcon’s last chick away from her! I don’t know that the person who tried to do that would fare very well in that battle either! She’s a VERY spunky falcon to say the least!!! Later today I will try to post a link to some video of her attacking the peephole at the nestbox on banding day. You’ll see what I mean. I wonder if the male that was nesting with that female in Genoa made any attempt to defend her, or does he dissasociate himself and mate with whomever wins? Apparently it didn’t make a difference that they were actively raising chicks at the time. I guess there’s no chivarly with peregrines. Here’s a link to the video I mentioned. You might want to fastforward to at least the halfway point. Kim, I watched the video & I guess she could hear noise from behind the peephole & since she couldn’t find her chicks she probably thought that’s where they were & was trying to get to her babies. If she was that fiesty it’s a wonder she would let anyone take her babies out of the nest or let them fall out. It doesn’t seem from the video that it would be that easy for the babies to fall out on their own. What a shame-hopefully the boy chick will be okay. It’s an invaluable source of webcam links, stories and postings. I directed them to both your sites, Kate and Kim, and they are frequent visitors. BTW, your photography is astonishing, Kim. Many of your photos look more like paintings. After getting a second chance, this is so depressing. This can be a tough obsession of ours sometimes. If there are any breaks in the “case,” let us know. I wonder if the successes of having these nestboxes in many places has finally resulted in a higher concentration of falcons in certain areas, and that that has led to competition for mates, nestboxes, etc. If so, there may be more documented cases of this in future seasons. Susan, this may well be the case. I participated in the 2nd Breeding Bird Atlas in Pennsylvania and was looking tonight at the statistics for peregrine falcons, comparing the first atlas (1984-1989) to the second (2004-2008) twenty years later. 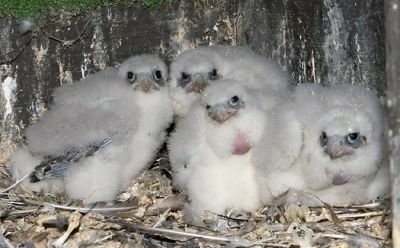 In the recent atlas peregrines were confirmed breeding in 27 of the state’s 67 map-blocks. In 1984-1989 they were confirmed in only 3 map-blocks. This huge resurgence from near extinction means the lives of today’s peregrines are much more competitive than those of 20 years ago. How ironic that a successful comeback from the brink results in these tragedies. And who could predict that they’d resort to killing a rival’s young?! I’ve heard male lions kill their rival’s young. I had no idea female peregrines would.